As you may have read in my Friendship post, I am on a mission to declutter my relationships. After my walk with the Lord, my connection with my husband is the most important one in my life. 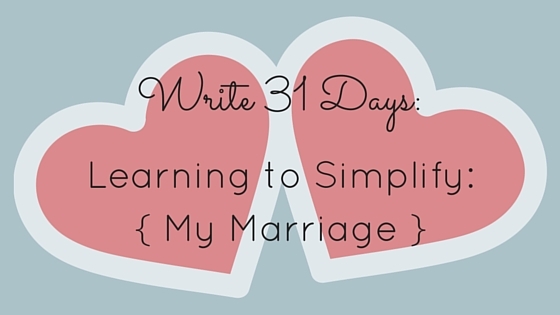 Over time, our marriage has become both simpler and more complicated. Our lives have only become more intertwined, with more shared pathways, the greatest of which is of course our child. It is simpler in that each day we are more one. Not that we always act like it. Obviously. Christlike care with each other’s feelings and hearts. Improved communication. Effort to understand each other better. Grace. Uplifting words to and about each other. More silliness and fun. Letting go of the little things. Quick to apologize and make peace. And here is what needs to be purged: Unrealistic expectations. Looking out for our own interests. Bratty tones and attitudes. Being quick to accuse and assume. Remembering each other’s failures. Mind-reading expectations. General unkindness. Yet again, the Golden Rule works here. I should just be the partner I want to have. Only, I’m a human being and that sounds wonderful until I hear a snarky comment about how high the dishes are piled in the sink. Or until he hears me complain again about the hunting gear littering the floor. This is where my first and most important relationship comes onto the scene: how is my walk with the Lord? When it suffers, so does my marriage. If I’m letting Christ do the guiding for my responses and actions, then treating my husband as I want to be treated is actually possible. Seven years is a long time, but not in the grand scheme of a lifetime together. I’m only at the beginning stages of learning how to really love my husband well. It takes daily sacrifice and commitment and compromise. Each day we gather up wisdom as we go, and lay down a little more pride along the way. But then somedays we get it completely backwards. We throw out our godly wisdom and then our arms have room to pick up prideful ways again. We live in a broken world and no one gets it right 100% of the time. My prayer is that we will get it right more than we get it wrong. I sometimes listen to podcasts by Andy Stanley, and he posed this simple question that I cannot forgot, especially when it comes to my relationship with my husband: What does love require of me?